Are you unintentionally contributing to the shame (and failure) that many clients experience who struggle with food and weight? Do you view the pursuit of weight loss as positive self-care? Do you believe that if your clients understand the underlying reasons why they overeat then they'll be able to control this behavior? These are some of the assumptions I made when I first began to treat eating and weight issues. If you're like me, you didn't receive training on this topic. Even if you don't specialize in eating disorders, many of your clients are likely to experience angst about their eating and/or weight, which can affect other issues including anxiety and depression. You may even struggle with eating and weight concerns yourself. 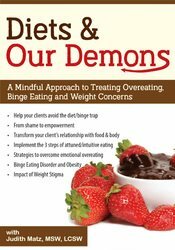 In this comprehensive one-day seminar I will teach you how to help your clients avoid the diet-binge trap and learn an approach that will put them in charge of their eating - no more relying on willpower! You will also learn transformational strategies and up-to-date research to address challenges facing higher weight clients, as you discover your own attitudes toward body size in a safe and supportive environment. Communicate the 5 common patterns of the diet-binge cycle. Teach the 3 steps of attuned/intuitive eating as the antidote to diet failure. Analyze the connection between overeating and emotional regulation. Implement at least 3 strategies to promote a healthy body image. Debate how the principles of Health At Every Size ® (HAES) help clients build self-care behaviors. Assess how internalized weight stigma affects both professionals and clients. Is the relationship between dieting and BED keeping your client stuck? Decide what to eat: Aka "making the match"
Become a change agent to dismantle diet culture - it's easier than you think! PESI, Inc., PE001, is a Continuing Professional Education (CPE) Accredited Provider with the Commission on Dietetic Registration (CDR) from July 1, 2018 through June 30, 2019. Registered dietitians (RDs) and dietetic technicians, registered (DTRs) will receive 6.07/1/2018 continuing professional education units (CPEUs) for completion of this program/materials. Continuing Professional Education Provider Accreditation does not constitute endorsement by CDR of a provider, program, or materials. This self-study program/material is designated as LEVEL 2. Nurses completing these self-study materials will earn 6.3 contact hours. Expires: 10/20/2020. PESI, Inc. is an AOTA Approved Provider of continuing education. Provider #: 3322. This self-study course qualifies for 6.0 self-study contact hours or .6 CEUs in the Category of Domain of OT and Occupational Therapy Process. The assignment of AOTA CEUs does not imply endorsement of specific course content, products, or clinical procedures by AOTA. Course Level: Intermediate. Expires: 10/20/2019.